Man cannot live on Noodles and Rice Dishes alone (see last blog), at least not for most Malaysians. Malaysia sits on a geographically strategic location in which historically it has received influences from different parts of the world due to trade from all directions and also stemming from being part of various empires, notably the South Indian Cholan and the Indonesian Srijavan empires, as well as its position as a Chinese vassal state for many centuries. Blessed with humid tropical climate in which literally anything will grow just by placing it in the soil, Malaysia is abundant with vegetables, fruits and herbs/spices that are incorporated into the cooking of an equally abundance of seafood, poultry and meat. Needless to say, Malaysian food is full-flavored, unique, and rather exotic even to some fellow Malaysians themselves. Here are the different breakfast, lunch, and dinner dishes that I managed to delight in during my recent visit to this part of the world. 1) Roti Chanai – This South Indian dish is a breakfast staple not only for the Indian community but for most Malaysians. Layers of finely stretched dough have been separated by clarified butter or margarine, much like an Asian version of Puff Pastry. After spending time on the flat griddle, it is usually served with some cooked dahl lentils and a light vegetable or fish curry. This dish brings back memories of stopping by roadside shacks and having this along with some hot pulled tea. A spicy start to the morning. 2) Ayam Buah Keluak – This dish is quite exotic even for some of my relatives as it hails from the Melaka Peranakan culture that traces its roots to Chinese migration to the area beginning in the 15th century. It is a stew that pairs chicken with the Keluak seed that grows in the island of Java. The seed is toxic in the raw form, but it produces a dark chocolate-like flesh after being cooked for some time. It can also be cooked with pork ribs, which my family prefers, or a firm flesh fish. I relish eating it when I am visiting my family since I do not get it anywhere else. This is soul food for me, despite its odd sounding description. 3) Asam Ikan – Again, like the above, this dish has its roots in the Peranakan culture, a subculture minority group that my family belongs to. It is fish that has been quickly simmered in a spicy and sour gravy made with tamarind along with a myriad of fragrant herbs and spices. 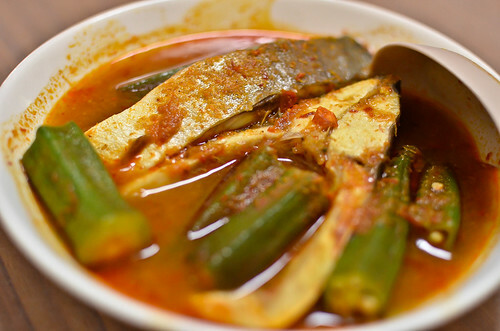 The use of okra (Malaysia – “lady’s fingers”) is customary as well as eggplant at times. This reminds me of our weekly serving of this dish as I was growing up with my grandmothers, and the sipping of the sauce which we could not get enough of. Spicy and Sour flavors dominate many Peranakan dishes, as in this one. 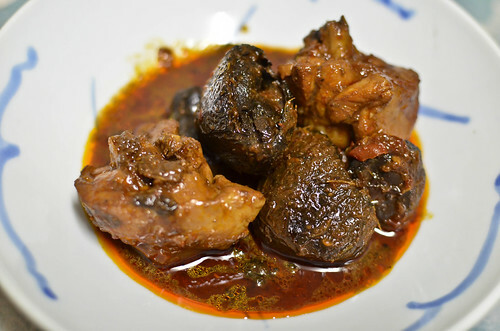 4) Pongteh – A classic Peranakan dish. 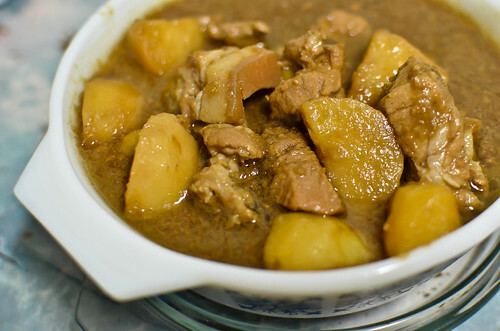 Pieces of Belly Pork are paired with potato and simmered in a rich fermented soybean paste sauce that is made fragrant with tons of shallots and garlic. This dish takes on many variations according to the cook – my paternal grandmother used to add bamboo shoots, and my maternal grandmother Chinese mushrooms. This was the must-cook dish that we were served by my auntie when we used to go down to visit her in my father’s village in Melaka. The dish brings back lots of memories and nostalgia when it is in my presence. 5) Yau Chow Kwai/Deep-Fried Dough – This breakfast dish literally translates as “Deep-fried Devils” since it resembles someone squirming in pain as the dough puffs and grows in the hot oil during the frying. 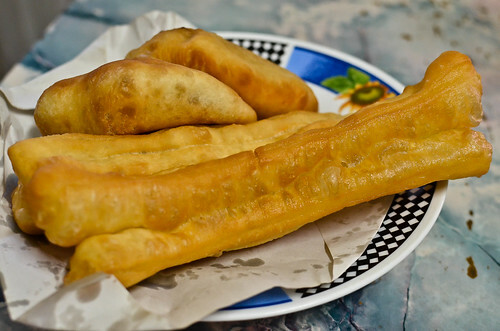 This is a typical Chinese breakfast staple that is usually bought at the morning markets in the various neighborhoods in Kuala Lumpur, much like a slightly salty churro. The crispy exterior and soft inside make it the perfect vehicle for dunking into some strong chicory-brewed coffee. Another favorite way of eating it is by slathering some coconut jam (Kaya) on it. Or it is just perfect as it is. 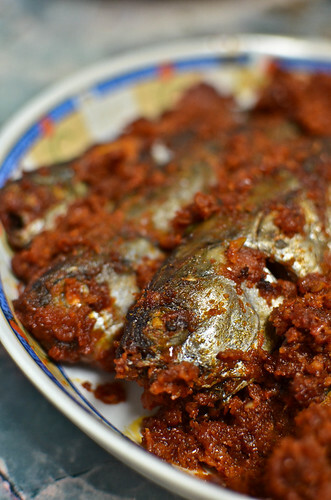 6)Sambal Ikan – Again, this fish dish hails from the Peranakan culture, which shares a close affinity with the Malay group. 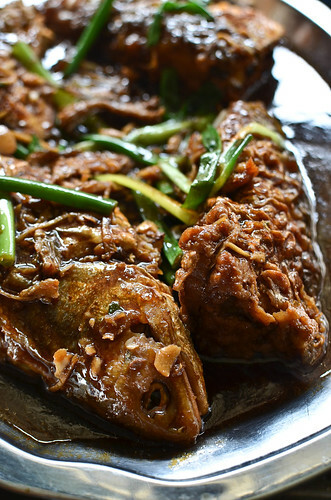 Here we see a Malay style dish in which fish, in this case fresh mackerel, are fried with a spicy concoction of dried chilies, shallots, garlic, shrimp paste, and candlenuts to produce quite a fragrant and fiery dish. The use of tamarind in the paste adds the sourness to elevate the dish beyond piquancy. I can recall my grandmother eating this with her hand, the traditional way, as she pried the rather firm flesh away from the whole fish. 7) Woo Tau Koh/Steamed Taro Cake – Another Chinese (Hokkien) breakfast staple. It is basically taro root (“yam” in Malaysia) that has been steamed with a flour mixture to produce a smooth potato-like savory cake. The seasonings are fried dried shrimp and shallots, with a topping of sweet hoisin and spicy chili sauces. Like most breakfast, this can be bought at the neighborhood morning market, which my mother would do on her frequent trips during the week. 8) Chinese Crispy Fried Chicken – this sumptuous poultry dish is the result of a whole chicken that has been evenly wok-fried to produce a crispy skin while keeping the meat moist and succulent. It is customarily served with both a white pepper/salt combination and a sweet plum sauce. 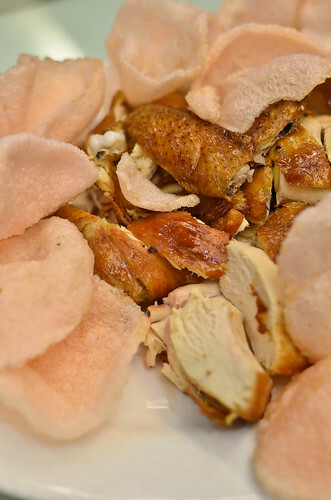 The clouds of prawn crackers around it mimic the same crispness of the chicken skin. This is definitely restaurant fare and I thoroughly enjoyed it with my uncle’s and cousin’s families. 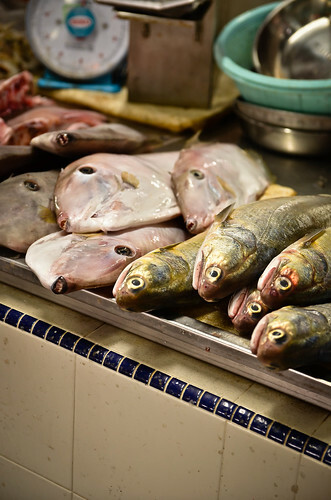 9) Steamed Fish – Seafood plays a prominent role in Southeast Asian diet, especially the fresh kind. Matter of fact, no one buys any of the frozen kind, maybe the odd foreigner living there. One of my joys of going back to Malaysia is to go to the open markets and look at the abundance of seafood that come from the local waters. The Chinese prefer to have their fish simply steamed with a few aromatics like ginger and green onions, along with a light sauce made of soy sauce, sesame oil, and some rice wine – this was the case with this dish when I sampled it. 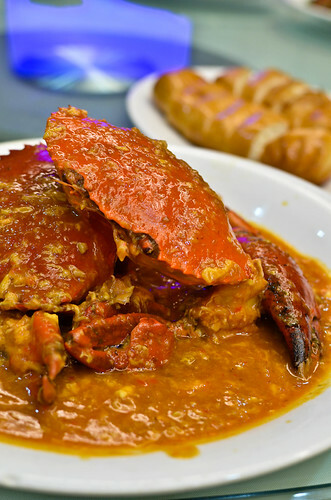 10) Chili Crab – this is the classic way of cooking this crustacean that has become a signature dish of the region. When I visited a seafood restaurant with my uncle and cousin, there were large tanks of seafood being displayed from which the live creatures were scooped up and whisked off to the kitchen. Everything served in that restaurant was alive just a few minutes before. The crabs here are cooked in a slightly spicy and sweet sauce that is enriched by the use of egg. Upon service, it is customary to lick off the delectable sauce from the shells before breaking them open to get to the sweet flesh. A side order of bread is provided to mop up every drop of that wonderful sauce. 11) Poh Piah/Fresh Spring Rolls – My maternal grandmother used to make this labor-intensive dish for our Saturday lunches. On this trip, my auntie was gracious enough to cater to my request for this dish that traces its roots to the immigrants from the Fujian region of China. 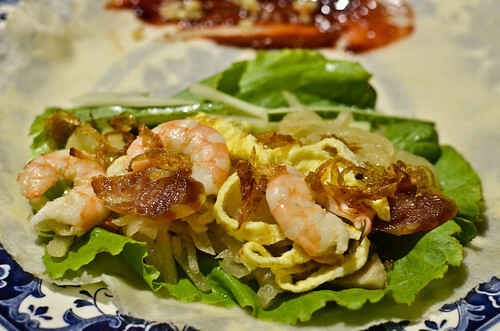 It is basically a fresh spring roll that is not deep-fried like the version most people know. The skin is a very thin sheet of dough that is completely cooked, and it is stuffed with cooked jicama along with some Chinese sausage and pieces of cooked shrimp, and the occasional crabmeat. The sweet sauce and chili paste on the other end of the crepe acts as the glue to seal the roll. I remember as kids, we would hold a competition to see how many we could roll without breakage and how many we could scoff our faces with. Unfortunately, I’m not able to consume as many, but not without the same amount of joy of yesteryear. 12) Hai Chou/Fried Pork, Fish and Shrimp Balls – During this last trip, I wanted to document some recipes that my maternal grandmother used to cook for us with the help of my auntie. One of the dishes was this surf and turf dish. 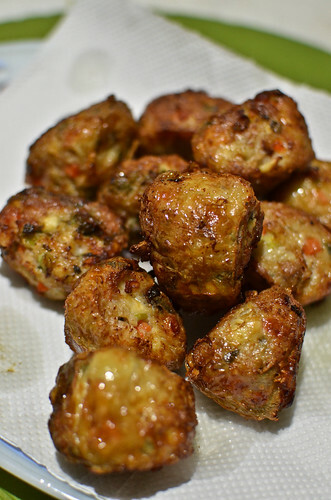 It is basically meatballs consisting of minced pork, minced fish, and diced shrimp that have been rolled up into large sheets of tofu skin, steamed, and deep-fried. The use of cilantro, carrots, green onions, and water chestnuts adds crunch and fresh fragrance to the dish. It is customary to serve them with a sour chili sauce that cuts through the rich-tasting morsels. Eating this dish immediately erased its absence of 25 years from my diet since my grandmother last prepared it. 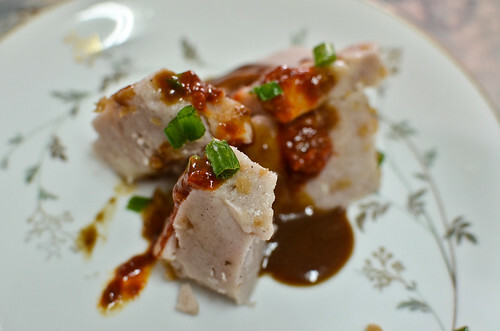 13) Leong Yee/Stuffed Fish – Another dish that was on my list of documenting my grandmother’s recipes was this fish dish. A delicate process has to be taken to remove the spine without tearing the fillets while keeping them intact on the fish. The fillets are scrapped of the flesh, minced with some pork, mixed with aromatics, then stuffed back into the fish cavity, and fried until fully cooked. 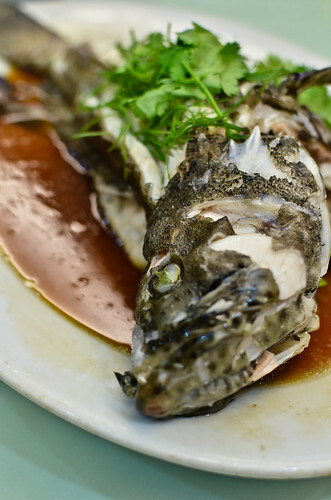 The whole fish is simmered in a soybean paste, garlic and ginger sauce until it is tender and has absorbed its savory flavors. Like the above offering, tasting this took me back 25 years when I last had this dish when grandma was still alive. Lots of memories, indeed. A second installment on the rest of the dishes will follow soon. Hopefully, this blog has whet your appetite for more Malaysian delicacies and the myriad of wonderful dishes. Wong, very well written! I grew up on those dishes too insingapore, and now am paying the price of leaving Singapore and my fav food. Where are in enjoying this cuisine in wash DC area? Thank you. 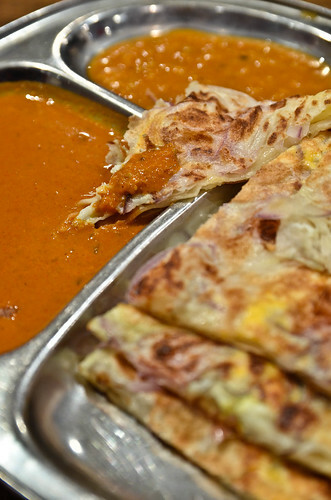 Unfortunately, there aren’t many good places for Malaysian/Singaporean cuisine in the area. Cafe Asia has some great dishes. There is Malaysia Kopitiam on M St but it is hit or miss. The best bet is NYC.